254 x 170 mm. – 111 leaves. Illuminated initials throughout, 5 large miniatures with full-page architectural borders and coats of arms. The full-page compositions that mark the beginnings of the most important text passages are clearly due to a remarkable collaboration. The miniaturist comes from the circle of the renowned French artist Jean Poyer from Tours (c. 1445-1503), who is verified and documented as painter, illuminator, designer for stained glass windows, etc. in the service of Louis XI, Charles VIII, and Louis XII. 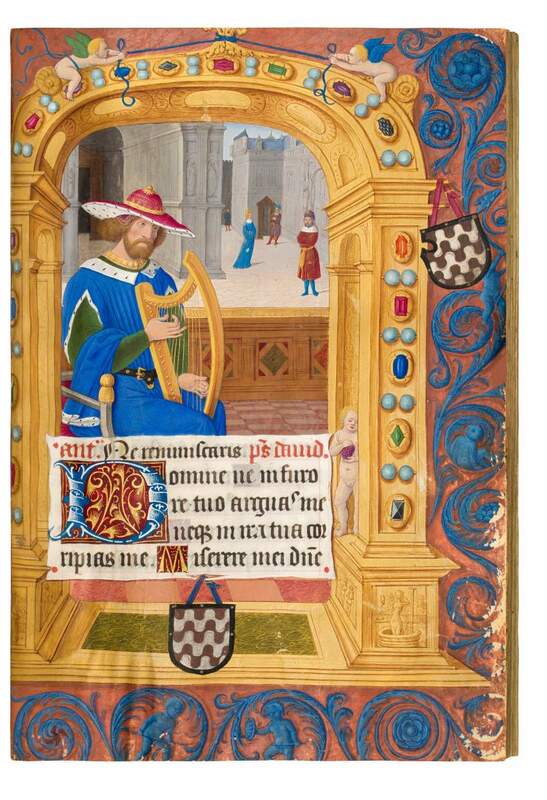 The sumptuous borders, however, rather relate to Italian design principles and are possibly the renowned painter Giovanni Todeschino who came to Tours with the exiled King of Naples, Frederick of Aragon. This manuscript gives an excellent example of the work of one the great workshops of illumination of Renaissance France. After Jean Fouquet’s death, Jean Poyer was praised as the equal of Jan van Eyck, Simon Marmion, and Rogier van der Weyden. The hallmarks of his style are evident in the present Hours: bold colour juxtapositions and a strong and confident feeling for vivid and expressive composition. Poyer headed a prolific workshop with numerous collaborators who unfailingly copied the master’s style. One of these captivating artists was responsible for the miniatures in the book at hand. The present deluxe Book of Hours boasts an unbroken line of provenance within the same French noble family.